In the summer of 2015, astronomers announced a strange new discovery from NASA’s planet hunting Kepler space observatory. Some object was blocking out about 22% of the light from its parent star: KIC 8462852. Even the largest planet in the Solar System, Jupiter, would only block out 1% of a star’s light, so something much larger must be doing this. But what? Astronomers proposed a few ideas: a cloud of comets, or a maybe the debris from a recently destroyed planet. But another idea was put on the table: an alien megastructure. Now keep in mind, aliens are way down in the list of possibilities here. It’s almost certainly, for sure, probably not aliens. Seriously, every other possibility is a zillion times more likely than aliens. But there’s a remote, non-zero chance that it’s aliens, and their alien megastructures. 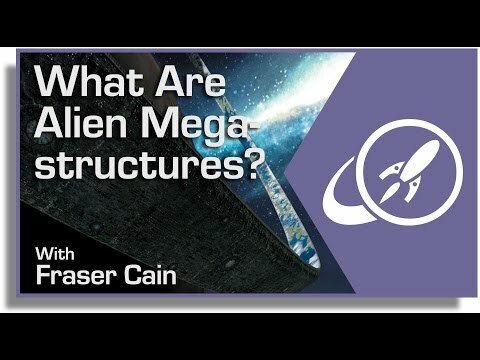 Are you having trouble imagining what an alien megastructure might look like, and why it would exist? No problem, join the club. All we’re doing is extrapolating from our current demand and growth for energy to its logical conclusion. Imagine the future of humanity. We use more energy now than we did in the past. And in the future, we’ll want even more energy. Eventually we’ll use up all the energy on Earth, then we’ll figure out how to use up all the energy flowing out of the Sun. After that, we’ll use up all the energy in the entire Milky Way. Finally, we’ll use up all the energy within every single galaxy that we can get our hands on. And to do this, we’re going to want to build megastructures. Aliens will call them alien megastructures. So what kind of megastructures will we build to extract all the energy from the Sun? Imagine you encased the entire Sun in a rigid sphere; this the concept of a Dyson Sphere, first described by Freeman Dyson back in the 1960s. In fact, if you dismantled every single planet, moon, comet and asteroid in the Solar System, you could build a shell around the Sun about half a meter thick. It would have an interior living space of about 600 million times what we currently have on Earth. And if you set the whole sphere turning, the people at the equator would experience Earthlike gravity from the centripetal force pushing them outward. This actually isn’t a great idea. You’d have to be pretty close to the equator to experience any gravity, and the forces on the whole sphere would try to tear it apart. There are no materials that we could imagine that could hold a structure like that together. A more realistic concept is a Dyson Swarm, where you build a single solar power collection satellite. And then use its energy to manufacture more of these things until there’s a cloud of them orbiting the Sun, and you’ve got your greedy hands on every single stray photon. Seen from afar, a cloud of these satellites would block the light from the Sun as they swept past, and make astronomers wonder if they’re seeing an alien megastructure. But for a powerful alien civilization with the ability to dismantle a Solar System, this is just the first step. The next megastructure is a Shkadov Thruster. This is a reflective half shell that’s put in place beside a star. Light pressure from the star pushes outward, holding the shell in place, and gravity from the shell pulls the star towards it. Over billions of years, a civilization could reorganize all the stars in their galaxy into a more useful configuration. Any galaxy that isn’t already moving away faster than the speed of light could be raw materials for a powerful civilization looking to get at every joule of energy. This all sounds like amazing science fiction, but the reality is that we have the tools to see if these alien megastructures have been constructed across the Universe. Although a Dyson sphere would block out the light from a star, infrared radiation would still escape from the outside of the shell. Astronomers have performed surveys to look for unusual objects that shine brightly in the infrared, and nothing has turned up. They’ve even looked at thousands of galaxies, to see if any have been completely colonized and converted into Dyson spheres. Still nothing, but they’ll keep looking. In just the last few months, the study of KIC 8462852 has gotten stranger. Astronomers looked back at old images of the star and found that it’s been slowly dimming over the last century. And this rules out the idea that a cloud of comets is blocking the light from the star. It’s still probably not aliens, but it’s definitely not comets. Although the idea of a megastructure sounds like science fiction, there’s nothing in the laws of physics that prohibits it. It would just take engineering at a scale that boggles the imagination. Fortunately, we should be able to detect any aliens building their megastructures in our neighborhood, so we’ll be able to admire their handiwork from afar. As always, let’s hope they’re friendly. So what do you think is causing KIC 846852 to dim? Which theory do you like the best? Tell us your thoughts in the comments below. Many times at the telescope eyepiece or with binoculars I’ve come across and noticed apparent strings of equally spaced stars. Sometimes these strings form straight lines and sometimes they follow smooth curves and may extend many degrees across the sky. In one of my most recent obs. runs I noticed one of these ‘strings’ coming out of M37. There is an arc of stars originating near the center of that open cluster which arcs several eyepiece FOV’s. Of course strings like this are probably just a form of pareidolia in the brain’s attempt to “connect the dots”? After all… it would take an infinite amount of energy for a vessel to achieve the speed of light, or nearly as much energy to approach that speed. WHAT IF, in achieving the light speed a vessel unintentionally creates a wake or shock wave at tremendous energies that wrinkle space-time and compresses interstellar gases to collapse and form new stars? Would a ship making such a traverse even know they were doing this as they raced ahead? So maybe.. we should be looking for other evidence? OR a line of stars apparently pointed in our direction? I was *just about* to respond with simply “Pareidolia.” until I hit this sentence. Consider that shapes in star formations are all relative to the perspective of the viewer, so if, for instance, you were looking at a perfect circle of stars, it would imply that the aliens organized those stars just for viewers on Earth. Not likely. As Alice is reputed to have said, this just gets ‘curiouser and curiouser’. So far, every other theory put forward has major flaws and the ‘megastructure’ theory is the only one whose main fault is ‘improbability’. I hope to live long enough to hear ‘the rest of the story’. Yes to all! It is probably just some missing neurons in MY brain? But, be that as it may, in some 30 years at the eyepiece, I’ve often seen linear patterns and wondered after them… or me? It even includes the relevant mathematics. The URL however is no longer valid. There is a very FREE program: CELESTIA. It will take your “connect the dots” to a different level when you go to a different POV / FOV and suddenly ‘see’ that the ‘circle’ or ‘arc’ or …. is now ‘gone’, when we take a 90 degree FOV from where we are on Earth. So the star 8462852 has 22% of its light blocked ? Compared to what ? Does Keppler have data from the star that shows it 22% brighter at some point ? Yes, exactly that. Kepler observed this star for a long time and saw that its brightness was roughly the same level (with slight wobbles) most of the time, but occasionally had dips that reduced the brightness by 22%. Solar systems collide. We’re most likely seeing the remnants of a star system whose main star went supernova and ejected the planets, comets, and asteroids towards KIC 8462852. And that KIC 8462852 captured those planets or what’s left of them while the brown dwarf is very far away. I would most likely be looking for a brown dwarf that exploded millions of years ago and was tracking relatively near KIC 8462852 at the time of explosion. I would also be looking for the dust cloud of an ancient explosion. Quite possibly one that has cooled off to the point of being hardly visible in the infra-red spectrum. That the leading edge of that cloud is now enveloping KIC 8462852. Both scenarios are a lot more plausible than alien megastructures. Now seriously, why can’t it simply be a clud of dust passing between us and that star? According to the text, what seems to have been disproved is that it would be something around the star, but with so much space between us and it, why couldn’t those objects be occupying another area of that space instead? I find the “Alien Equation” fun and yes, I’ll admit funny. We try so hard to fit “Aliens” into “our image”, into “our technology that they should have”, to where they are not “alien” any more. Case In Point: Until actual pictures were seen of the Duckbill Platypus, it was thought to be “alien” or more to the point, that the explorers then were “pulling the listeners legs” -aka- a joke. No such animal was thought to exist. It was “alien”. It did ‘not fit’ into the zoology of what WE thought, then, an animal would look like. I mean the left over parts of a Duck, Beaver and an Otter. I mean seriously!!??? Plus, are we trying to fit the “order” and “physics” of that star system into Sol’s solar system? That is not Sol. Like when we discover hyper giants, and super giants and bigger stars … what about a planet that is bigger then Jupiter by a very large percent? What about several planets that went BOOM! from the old “pinball” equation … 1 went flying and ‘bumped’ into another and those two bumped into … and you get the idea. It’s an alien solar system and some new physics could be at play that we’ve not thought of *seen* yet. Just like the duckbill platypus.